Anzac Day is a special and emotional day for New Zealanders and Australians. 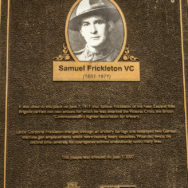 Anzac Day marks the anniversary of the first campaign (Gallipoli) that led to major casualties for Australian and New Zealand forces during the First World War. It also marks the beginning of an awareness of each country as independent nations and not just outposts of the Britain. 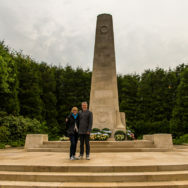 This year instead of being on the other side of the world we were only a couple of hours away from where the New Zealand Division fought and died during World War One. Messines was one of the major battles (June 1917) involving the New Zealanders on the Western Front and it was a privilege to be able to pay our respects to a past generation in the place they showed such courage. 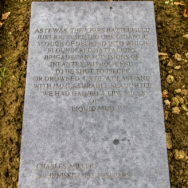 It is also a battle that has a very personal connection for Kate as her grandfather (Alfred Wise) served in the New Zealand Machine Gun Corp at the battle of Messines. He was in Europe for approximately three years and was among the lucky ones who survived the war. Not only did he get to go home but he took his new English wife back with him. While in England he met and married Kate’s grandmother. This personal connection certainly added to the emotion of attending the services and visiting the military cemeteries. The day started with the morning service at the New Zealand Memorial in Messines. The service was uniquely Kiwi with the dignitaries being called into the memorial grounds by the soulful calls of a Kuia (Elderly Maori Lady) and a Maori member of New Zealand’s armed forces, taiaha in hand, leading them in. As any Kiwi knows these sounds and ceremonies make the hair on the back of your neck stand up and bring a tear to the eye, especially when so far from home. It was a special way to start the day. In the morning the Kiwi’s and the Aussie’s have separate services but at 11am they have a combined service. This service is held at the Menin Gate in Ypres. The Menin Gate is an impressive memorial to those that died during World War One with thousands of names listed on it’s walls. The service here was more formal with dignitaries from all the countries who fought in World War One laying wreaths. Seeing the Aussie, Kiwi and Belgium veterans marching to the gate being lead by a band from a Western Australian School was very cool. After the ANZAC Service we had planned to visit the Commonwealth War Cemetery in Tyne Cot but we ended up doing a bit more than anticipated. We started by going to the Fields of Flanders Museum in Ypres, I would recommend a visit if you are ever in the town as it is a very well presented museum dedicated to the soldiers of all nations who fought in that area. That was followed by a visit to the Tyne Cot Cemetery, with the memorial wall of names that goes on forever. There were names of men who had died from the New Zealand Machine Gun Corp and you have to wonder whether Kate’s grandfather knew any of the unfortunate ones. Wandering through cemeteries in this area makes you acutely aware of the massive loss of life that was suffered by so many, so far from home. I think the saddest part are thousands of graves with headstones that may list the person as a Kiwi or Aussie but the name says “A Soldier of the Great War” because they were unable to identify them. The next stop was an unveiling of a new statue dedicated to the memory of the Kiwis who fought and liberated the town of Messines. 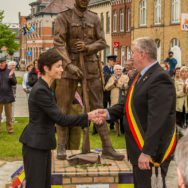 The New Zealand Ambassador to Belgium and the Mayor of Messines unveiled the statue in front of a small crowd of locals and a few dozen Kiwis. New Zealanders are held in very high regard in this part of Belgium. The last thing on the agenda for the day was the Last Post ceremony at Menin Gate. This ceremony is enacted every evening and has been ever since the end of World War One (with the exception of the German Occupation during World War 2). The Last Post, the traditional final salute to the fallen, is played by the buglers in honour of the memory of the soldiers of the former British Empire and its allies, who died in the Ypres Salient during the First World War. Once again the emotions ran high as the bugles played and it is wonderful to see the Belgium people honouring those who gave their lives in such a way. Well this post took a while to write but I wanted to try and do the emotion of the day justice. We will return to honour those that have fallen, especially because some are sure to be “mates” of Kate’s Granddad. Wow, what an amazing day that would have been. Thanks for sharing it. It is something we will do again Soph.